How does alcohol influence study results? Students created an app that uses the gyroscope in the smartphone to establish walking patterns. Combining this with GPS the App determines when the student is in an alcohol – infested area. If so, the App checks your walking patterns and tries to find out if you are drunk or not. This data then is correlate with study results. 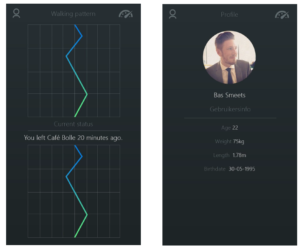 Walking Patterns is a prototype app. Do you want to continue the work that is done. E-mail me at r.vandervorst(at)fontys.nl and I will sent you alle materials, design and code.